The Fresh Veggie family were enjoying their time off together. They were eating some ice-cream and they had some fresh strawberries on it. “That is really funny,” laughed Christopher Corn. “What is so funny?” asked Mrs. Tomato. “Did you know that technically tomatoes are fruit?” laughed Christopher Corn. Christopher thought about what Mrs. Tomato had just said. There was no way that tomatoes and ice-cream would ever be a good mix. He just couldn’t see it. “How about I say that I am part vegetable?” asked Mrs. Tomato. “That sounds good to me,” said Christopher. Christopher got up and grabbed his guitar. Christopher had every one in stitches laughing. 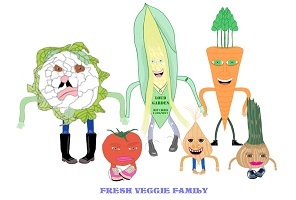 The Fresh Veggie family had such a good time together. Be whatever you are comfortable being. Example: Mrs. Tomato felt more comfortable being a vegetable than a fruit. This entry was posted in Fresh Veggie Family Stories, Grade 3 Level, Summer Stories, Summer Story Challenge 2017 and tagged Christopher Corn, Fresh Veggie Family, fruit, Mrs. Tomato, vegetable, Vegetable or Fruit. Bookmark the permalink.